Use your existing skills to create a fully featured mobile web application. This theme is more than just a mobile website template, it includes 10 mobile-optimised block templates and 1 BONUS mobile photo gallery block. Mobile web applications are in high demand worldwide, so if you're a designer or developer and don't offer this service to your clients already, you now can! And best of all, it's a very lucrative market. Mobile web apps are usually charged at US$12k-$95k (depending on project scope). With this theme + Concrete5, you can build a professional web app in just minutes rather than hours or days. You can use your existing C5 skills to build it. No need to wait for approval from Apple to publish mobile app - instant deployment. Users can add a "bookmark" to the mobile device home screen. The icon can be customised along with a "loading" screen. When a web app is run. From the "bookmark" it opens in a full screen browser and looks just like a native app (no browser navigation buttons). Custom block templates for popular blocks: form, guestbook, image, login, next/previous, pagelist, rss, search and Youtube. So these blocks look just like an iPhone app. BONUS mobile gallery block included which looks just like the iPhone "Photo" app, with swipe action to navigate between photos. If you are experienced in development with C5, you can create your own block templates for almost any other block. AJAX page loading supported (using a custom page attribute). You can easily add a "back" button (using a custom page attribute). Preload selected pages for super-fast loading times and transitions between pages (using a custom page attribute). You can easily hide the toolbar for a specific page (using a custom page attribute). Automatic display of animated message encouraging users to "bookmark" the web app (add to home screen). Preliminary support for iPad optimized interface. See a 2-pane layout on an iPad device and automatically see only 1 pane on an iPhone - no need to change your site content.See demo. Additional features will be built on this in upcoming releases. Since the web app runs through the mobile browser security is inherently stricter compared to a native app. The web app can't take advantage of some hardware features (like camera, accelerometer, etc). The only hardware feature compatible with mobile browsers (and HTML5) is the GPS - which is useful for making a map-style app. Although mobile web browsers try to do everything that desktop web browsers do, they just can't. Hardware processing power on a mobile device is far less than a desktop, so be cautious with processor-intensive scripts (such as jQuery animations, slideshows, etc). Mobile apps tend to be more simple in structure compared to large websites, so use the "keep it simple" rule when building with this theme. A special thanks to David Kaneda, Jonathan Stark and Thomas Yip. This is based the jqTouch jQuery library (BeeDesk's fork), but with several significant improvements and additions. 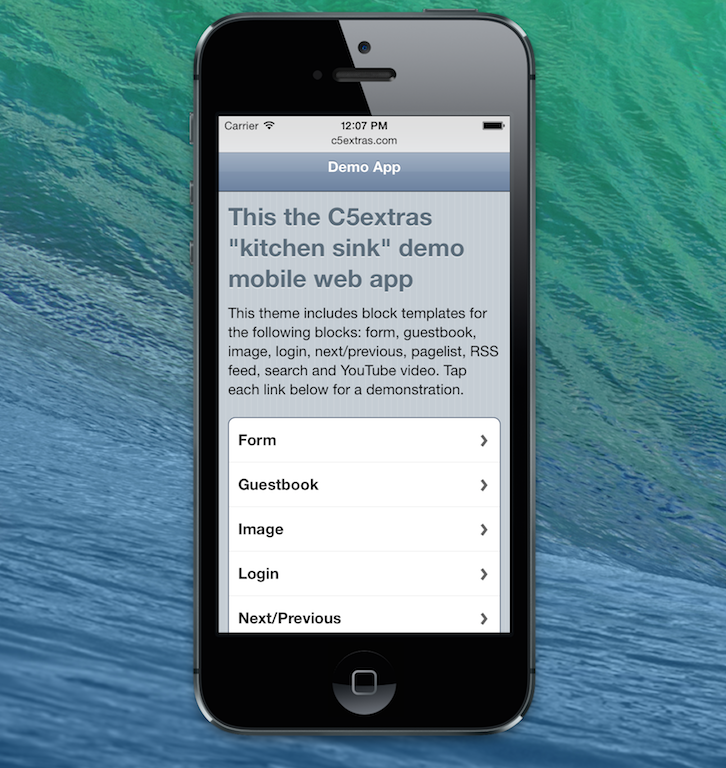 The demonstration web app is best viewed on an iPhone or Android-powered mobile device. Alternatively, if you use a Mac, the iOS Simulator (part of Xcode) is just as good. As a last resort, you can view it in Safari or Google Chrome and just resize your browser window to resemble a small mobile screen (but please note some formatting and animations may not be fully compatible). Read some handy tips to get the most out of the Mobile App theme.